These are very popular and are the most common systems found commercially and mainly made of plastic, wooden ones are available but less common and most of them are personal projects being sold online. They are great to start with, their continuous flow design allows you to harvest the castings while not disturbing the worms. You basically feed your first tray at the bottom then add a new tray on top when it is full, then when all available trays are full, you harvest the bottommost one and put it back at the top once emptied. 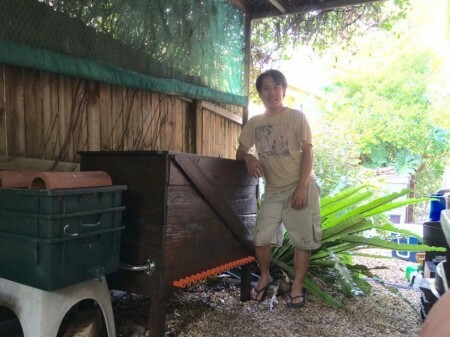 Those who have the space and want to compost more often go for a simple crate. I built mine out of bed slates (I called it Quasimodo) and it works just fine, it breathes nicely and the vermicompost is moist and crumbly. 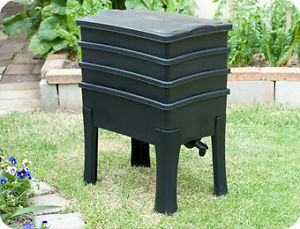 Big boys and girls will often go for this type of worm bin. Just like the stacking tray systems, they are use a continous flow principle, but because there are not separated compartments, the castings are flowing through from top to bottom where they are harvested. Gargantua is another DIY project of mine, it measures 100x60x60 cm (3.2x2.0x2.0 ft), it has a false bottom made of PVC pipes and I harvest it with a three prongs garden rake. A CFT breathes much better than tray, air comes in from above, bottom and sides (depends on what material and how it was built), this allows a density of worms up to twice of the plastic trays. A true CFT requires an optimum depth of 2ft or at least 20", this to allow all cocoons to hatch and worms to migrate upwards when it is ready to harvest (when full to top). This is a sub-category of CFT. Instead of being build of wood or plastic, they are made of fabric. That means they are very lightweight (when empty) and can be shipped easily. The Swag is the first of them. It is an Australian made product built from a strong fabric. It was designed so you can suspend the Swag to a branch under a tree, no stand, just three ropes. It has a diameter of 60cm (2ft) and a depth of about 48cm (19”). No more lifting of heavy trays, the Swag has an opening at the bottom from where you would easily harvest the vermicompost. At a depth of 19", it is not deep enough to be considered real CFT and you will find some worms in your harvested castings. It can host an amazing density of worms of up to 3 times that of a regular plastic tray system thanks to more oxygen reaching the core of the bedding. it has a lid made of netting material held in place with a zipper. This allows more airflow while keeping bugs at bay. However, when installed outdoor it won’t protect much from the rain, although this is good because the Worm Inn dries fast, it also leaches nutrient away from the vermicompost. for extra dollars you can get a set of PVC joints and you need to spend more to buy the PVC pipes, cut them and make your own stand/frame. both the Worm Inn and the Worm Inn Mégas are true CFT (Continuous Flow Through) système as they have minimum depth of 20” with the Mega reaching 30”. It is generally advised to start harvesting when full and filling 30” will take a while. This week, my friend Steve Churchill (founder of the Urban Worm Company, managing partner of the Worm Farming Alliance) has announced he has started a new product, the Urban Worm Bag. Looks familiar? Yes, it looks like a Worm Inn and based on the specs it seems to be a Worm Inn Mega on steroids with a lot of problems solved. What do I think of the product? The Urban Worm Bag is not released yet (available for pre-order, see the link at the bottom) so it is early to give a review, but from experience with other product I just wanted to give an early opinion based on description, photos and discussion with Steve. I’m glad someone has stepped up and made a better product of something that was already great. a Worm Inn thanks to its extra breathability is said to be able to host 3x the worm density compared to a plastic system, a wooden CFT is said to be able to host 2x the density of worms. The Urban Worm Bag less than 3x but certainly more than 1x (it does not have a large opening at the bottom like a wooden CFT). My food challenge with the Swag has revealed that it has high performance despite being made of non breathable fabric. So I'm sure the Urban Worm Bag will be great. The stand is made of lightweight iron and joint by plastic 3-way connectors, so it should be very sturdy. No DIY required as the stand is part of the whole package. Some of you might want to build your own and I heard Steve might offer a bag only version in the future. I do love suspending the Swag as this gives me the ability to adjust the height but having a stand is great for treeless backyards and I’m sure you can easily adapt the stands of the UWB to attach ropes to it and not use the bottom parts. The zippers (for the cover and the bottom pocket) are made of military grade quality and durable material, castings might clogger it a bit, but with a simple brush or a garden hose spray it should be fairly easy to clean and unclog. It is made of the same fabric as the whole system which will protects the content from the rain, although I’m sure a bit of water will make it way in but that’s good. 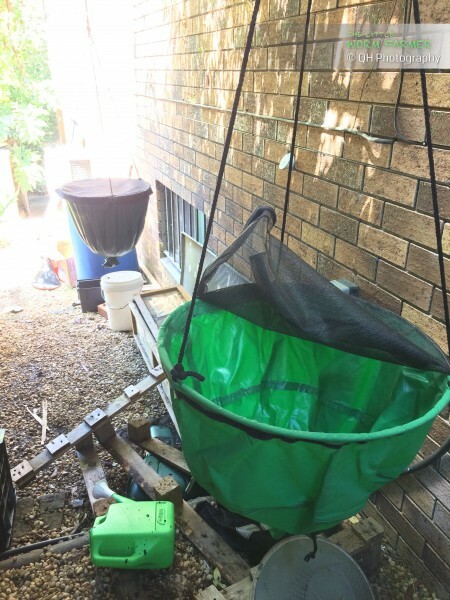 Some might prefer the netting fabric used in the Worm Inn and Mega because you can see through and monitor the level of the bedding without removing the cover and you can also water or dust some Diatomaceous Earth or garden lime through the netting. However, this also means that when you install it outdoors, the rainwater will flood the bedding and leach out the nutrients and you end up with a muddy vermicompost. 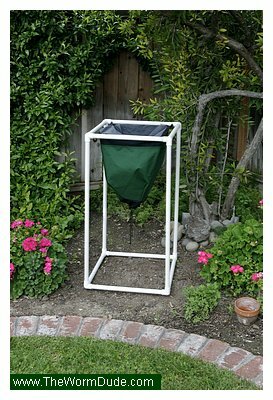 So I think this is a good choice for Urban Worm Bag cover, it protects from the rain (a bit of water will get through surely) and from flying insects, you'll just need a bit more effort for watering and dusting products. 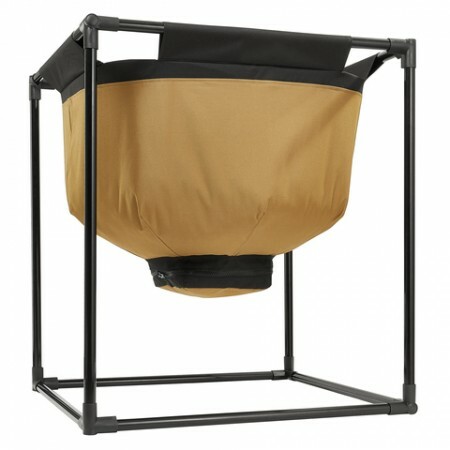 With the frame and stand the Urban Worm Bag dimensions are about: 27x27x30 inches. The available surface area of the bag ix 25x25" (about 4.3 sqft) that is more than the Worm Inn Mega (20x20"). With worms, we all know that surface area is more important than depth when it comes to how much worms you can have, so this is great news. The depth of the UWB is 22" which is within the range to make it a true CFT worm bin. It is not as deep as the Worm Inn Mega (30") which I think is a good thing, because that means you will fill it faster, although those who compost a lot might miss the extra storage volume. The UWB + stand will cost you $109 USD including free shipping to USA and at reception you can install, set it up and get going immediately. The Worm Inn Mega without stand costs $109.99. The extra stand kit (custom fittings + zip ties, you need to buy the PVC pipes) costs $9.99 USD. The basic package will require some of your time and skills/ingenuity to build a kind of stand for it, buying the extra stand kit will still require you to buy some PVC pipes and cut them to size. So comparing apples with apples, with a stand, the UBW is the most affordable option. Is the Urban Worm Bag the best worm bin? Can there be a best worm bin? Probably not, we all live in different climates, have different use and management of a worm bin, different time available to care for it. So easy answer: no. But should you buy it? Maybe. Compared to a stacking tray system, there is no doubt, I would go for a Worm Inn, Swag or UWB any day. No heavy lifting, easy harvest, better performance. We cannot compare the UWB to a full size CFT as they are for different purposes. if you want performance and can put the time/effort in maintaining the moisture then the Worm Inn Mega would be better for you but you also need to put time and money into building a stand or some way to suspend it. I’m pretty confident that the Urban Worm Bag will be a great performing system and on top of all the good points. you can have a peace of mind and know someone will be taking care of you if something was wrong with the bag. 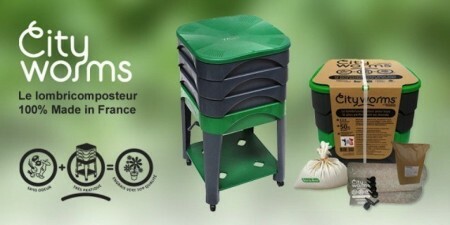 I’m pretty sure the Urban Worm Bag will quickly become a popular worm farming system in the USA. I will be trying to get my hands on a test model (Steve, I’m looking at you) so I can make a more detail review. I will also discuss with Steve to get some kind of arrangement to distribute this product in Australia, if you do support this idea please let me know. Meanwhile, here is the user guide that comes with the Urban Worm Bag.